Dramatic reductions in Alice Springs in alcohol consumption and alcohol related family violence assaults are likely to feature prominently in next week’s public meeting about control measures in the next two years. The draft Alcohol Management Plan 2015-2017 released last week reports that people in Alice Springs drink alcohol at a higher per capita level than the national average, (Australian average is 9.7 litres pure alcohol consumption per person, NT is over 13 litres), but “significant progress has been made in reducing alcohol harms”. The draft says: “From the 2006 calendar year, when the Alcohol Management Plan (AMP) and Supply Plan for Alice Springs was put in place, until the 2014 calendar year the wholesale alcohol supply reduced in Alice Springs by 28%. “During the 2014 calendar year the total wholesale supply decreased by 10%. “Over the last 12 months from June 1, 2014 to May 31, 2015 there has been a reduction in the level of alcohol assaults in Alice Springs compared to the previous 12 months of 22.2%. The meeting will be held next Wednesday at 5.30pm in the Andy McNeil Room, Alice Springs Town Council Chambers. 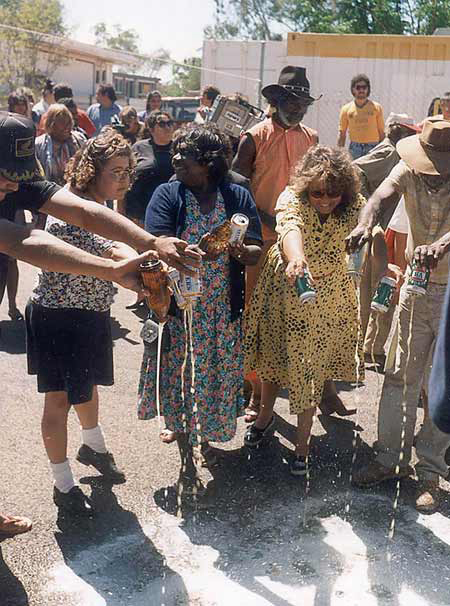 PHOTO: Tipping out alcohol when the Congress Shop surrendered its liquor licence in 1990. Yes Bev, a person with a drinking problems is their personal issue. But I have seen far too many times the violence that comes with it. Carloads of people come to a home, smashing everything and attacking people. We all have the right to feel safe. And give all children hope for a strong future. I dont believe anyone has any right to blame any political party for drinking problems which is a personal issue and anyone drinking more than they should is showing everyone how stupid they are. Yes, strong futures are built from decent behaviour not alcohol and drug induced lunacy. As for fracking Alice and other areas are reliant on the underground water supply so anyone doing anything to interfere with that is actually harming many people and will go down in history for doing so. Let’s hope Jacinta can actually learn to lead her people away from the past and build bridges to the future involving all people here. Anyone who divides between races is very damaging to this community and the links to the past, and the blame game needs to stop. All the compensation in the world cannot undo past damage and the religions and political parties plus the different cultures need to understand the consequences of rivalry and start thinking in broader community focused term. This applies to rich and poor – balance and moderation in all things. I’m just back from my daily dog-walk along the railway corridor north from Bradshaw Drive, and once again the bags I carry to collect empty drink containers came back themselves empty. Whether it’s the police presence outside the bottle shops, or a growing public awareness, or a combination of the two, there is little doubt that public drinking is tapering off. Good! Oh my god were are all the trolls to blame this on the CLP. Hang on this is a good news story, let’s get back to fracking and high rise. Free from family violence. Strong futures.